THE CRISPY COOK: Pies and Peril, a book review of a new culinary mystery series and a giveaway! Pies and Peril, a book review of a new culinary mystery series and a giveaway! 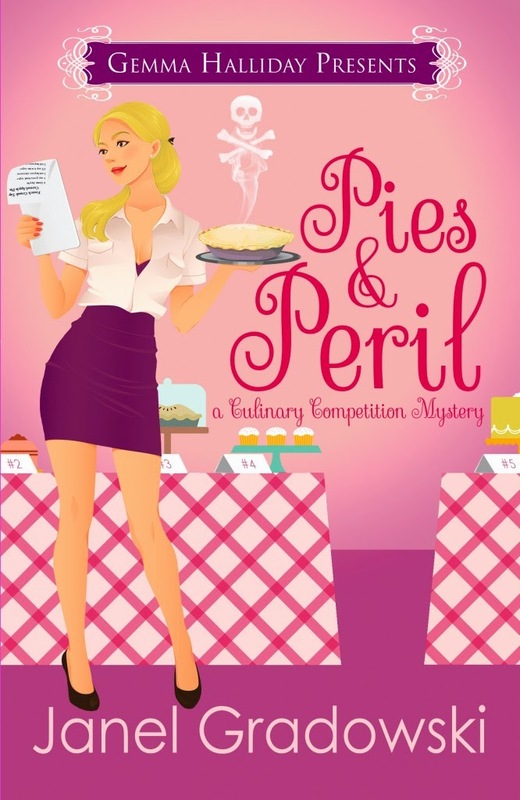 Janel Gradowski's new book, Pies and Peril: A Culinary Competition Mystery (Gemma Halliday, 2014), is the first in a new mystery series that is sure to win over fans of foodie fiction. Amy is the heroine of this novel, a former hairdresser turned baker and competitive cook. She enters her small town Michigan baking contest and aims to win the triple crown in Cookies, Cakes and Pies, but the pie contest crown has been worn for the last five years by the villainous Mandy Jo, Amy's former friend and coworker. When Amy delivers her scrumptious pie entry to the contest she discovers Mandy Jo's recently murdered body, garnished with a raspberry pie to the face, and sets about aiding the police in uncovering the murderer. This cozy mystery is full of humor, mouthwatering food descriptions, and engaging characters, from Amy's sidekick, emergency room nurse Carla to her pie-scarfing dog Pogo, and is the perfect summer read, as light and luscious as, well, a Key Lime Pie. I am honored to be part of the author's blog tour and pleased to be able to offer a giveaway of an e-book version of this fun new mystery to one of my Crispy Cook readers. To enter the giveaway just leave a comment below telling me about your favorite kind of pie by the deadline of Wednesday, July 23, 2014 and I'll pick a random entry to receive this prize. Be sure to check out the other stops on the Pies and Peril Blog Tour for other reviews of this book and to enter other giveaways for the ebook. Janel is a frequent participant in Weekend Cooking, a weekly roundup of foodie posts over at Beth Fish Reads, which is where I met her, and so naturally I am linking up this post over there. My favorite pie is Pumpkin. This books sounds great! This sounds like a fun book - full of scrumptious food! I don't want to enter, but I love blueberry pie (made with fresh blueberries). I've only had it that way twice, but it was amazing! My favorite pie is raspberry/blueberry deepdish pie like Mom always made for my birthdays. The book sounds excellent ... food mysteries are great!! As anyone who knows me knows, I love a good culinary cozy mystery! I really need to make time to read Janel's new book: sounds like the perfect summer read. I'm glad you enjoyed Pies and Peril, too. Don't enter me in the contest since I've read it, but my favorite pie is chocolate-pecan. My favorite pie is strawberry rhubarb. This book looks like a fun read. Thanks for the chance to win. You can never go wrong with homemade blueberry pie! Thanks for highlighting this new book. It depends on what time of the year it is. Normally my favorite is coconut cream pie but in the fall it's pumpkin. I've always been partial to French Apple pie.